St. Rita’s Medical Center serves a 10-county area in northwestern Ohio and is the largest hospital in a 70-mile radius. 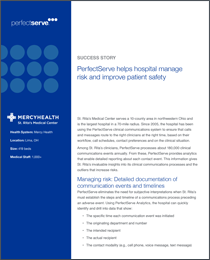 Since 2005, the hospital has been using the PerfectServe clinical communications system to ensure that calls and messages route to the right clinicians at the right time, based on their workflow, call schedules, contact preferences and on the clinical situation. Among St. Rita’s clinicians, PerfectServe processes about 180,000 clinical communications events annually. From these, PerfectServe provides analytics that enable detailed reporting about each contact event. This information gives St. Rita’s invaluable insights into its clinical communications processes and the outliers that increase risks. The hospital uses these data when it investigates cases relating to quality or risk management. In fact, St. Rita’s decided to implement PerfectServe after it was unable to prove that one of its nurses had contacted a physician three times. The lack of documented evidence was a key factor in an unfavorable lawsuit that cost the hospital hundreds of thousands of dollars. At most hospitals, including St. Rita’s, the vast majority of physician orders are still written by hand. A recent report found that only 14 percent of all U.S. hospitals are entering at least 10 percent of orders electronically, which is the level of computerized physician order entry (CPOE) required to reach the federal government’s proposed standard for Stage 1 of meaningful use. The legibility of handwritten orders can be a problem that is more pervasive, and more of a threat to patient safety, than most hospitals realize. In an article in Trustee® magazine,* an executive from The Joint Commission notes that his agency “almost always finds instances where handwriting is of poor quality.” According to the Agency for Healthcare Research and Quality, poor penmanship is responsible for an estimated 6 percent of all hospital medication errors. To address this issue, St. Rita’s used PerfectServe to document and measure incidents of illegible handwriting. For defined periods of time, PerfectServe prompted callers to indicate when they were calling to clarify an illegible order. The system captured data on where the order was received as well as who wrote it. PerfectServe compiled this information into reports for the Patient Safety Steering Committee at St. Rita’s. The analysis showed that during the first three months of the study, an average of more than 80 calls per week were made to clarify orders. After discussion with some of the doctors, subsequent analyses indicated the average was 53, a drop of more than 40 percent. According to The Joint Commission, communications breakdown is the single greatest contributing factor to sentinel events and delays in care in U.S. hospitals. St. Rita’s uses PerfectServe to track a key source for such breakdowns (i.e., physicians who do not respond to calls). Of the hospital’s approximately 15,000 monthly communication events processed by PerfectServe, about 15 to 25 are directed to the PerfectServe Help Center to report a problem with a physician not responding. Dr. Schumm and the patient safety team use these reports as a way to open a constructive dialogue with physicians whose names repeatedly appear on this list. Since PerfectServe collects communications process information automatically, nurses do not have to “tattle” on doctors who do not always respond in a timely manner. This not only relieves nurses of an uncomfortable task, but also enables St. Rita’s to avoid adversarial situations that can undermine nurse-physician relationships. *Glabman, Maureen. “Death by Handwriting,” Trustee®, October 2005.